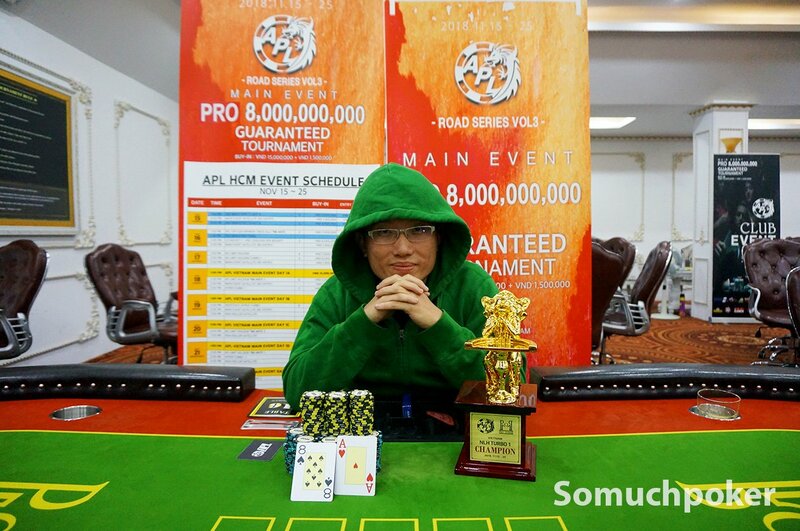 The games are heating up in Vietnam with APL Ho Chi Minh City – Road Series Vol.3 underway at Pro Poker Club. 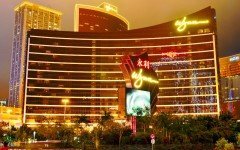 Now on its third day, side events have been keeping players very busy before the upcoming Main Event – VND 8 Billion Guaranteed. In addition to the first-ever DeepStack Open Vietnam title awarded to Hwang Sang Yeon, four other events wrapped up with Kim Ki Nam, Kjell Ove Dyb, Shyh Chyn Lim, and Nguyen Quoc Vu claiming trophies. As always, the KO Bounty was a popular one pulling in 94 entries. One drawing factor for an event of this type is the bounty reward for each head scalped. 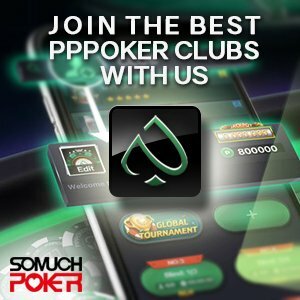 At this tournament, players received VND 1.5M for every elimination and if you happened to be the last bounty hunter standing, then you kept your bounty as well. 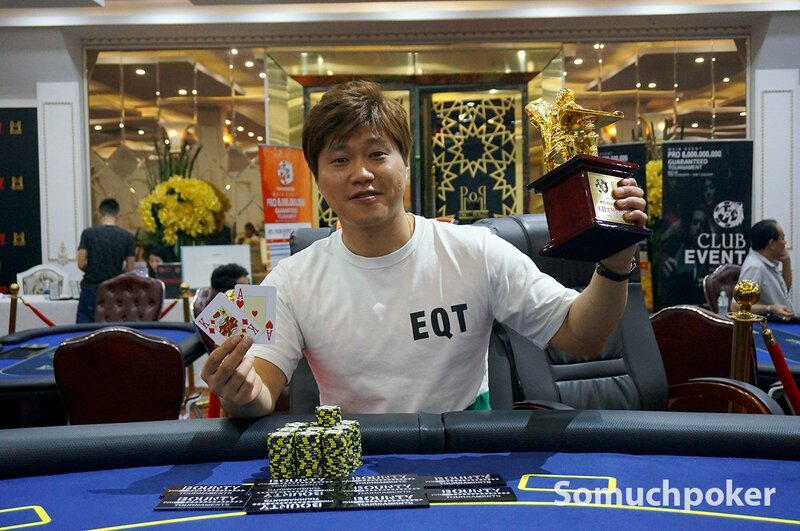 Winning the event was Kim Ki Nam who dominated at four-handed. 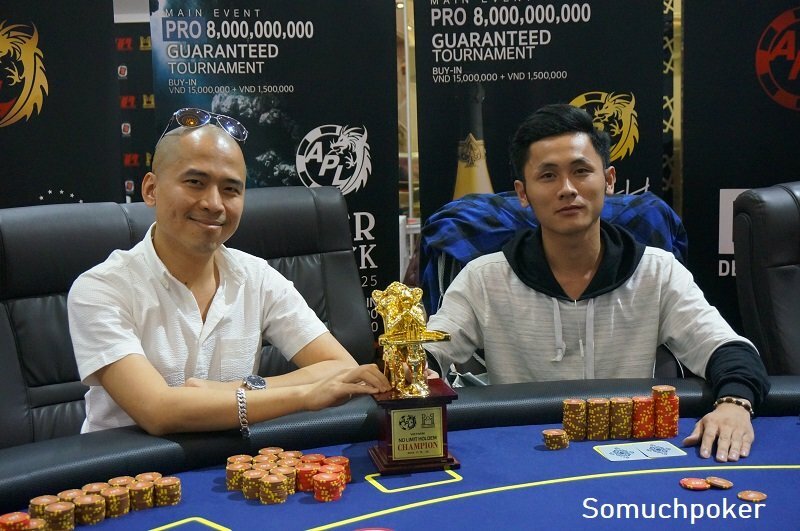 He defeated Nong Mitchell Minh at heads up to earn the VND 128,830,000 (US$5,527) first prize. He also collected on 10 bounties. The KO Bounty event ran for two days. 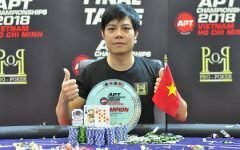 On the first day, the bubble burst when Nghiem Quang Huy eliminated a player with over on a board that ran . This left 12 happy players in the money. The day closed with the elimination of two players on a four-way all in. The final 8 bagged up and returned after a night’s break. The final table streamed live on YouTube, you can watch the action via this link. 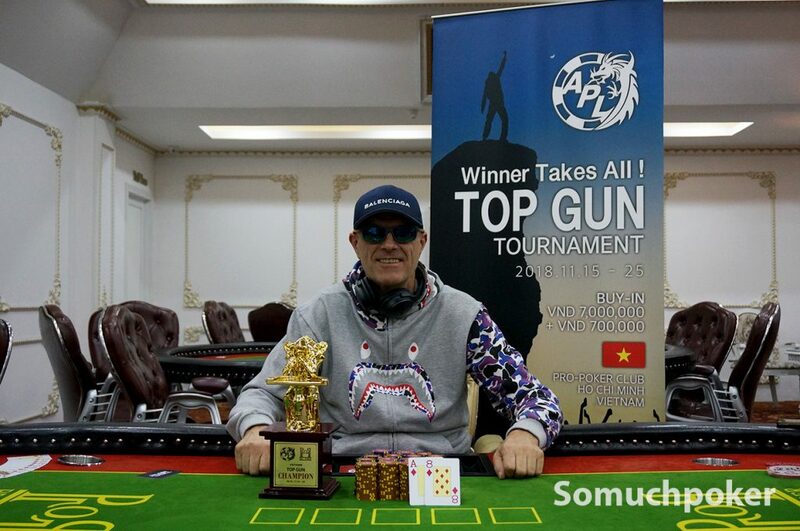 The APL TOP GUN event was a newcomer to the roster. Although it only attracted 16 entries, this was juicy enough for a winner-take-all pot with each player contributing VND 7.7M. Among the players that attended were Vincent Li, Michael Kim Falcon, Frederic Boillet, Do Hoang Long. Heads up action was between Nguyen Duc Bien and Kjell Ove Dyb. The final hand was a head turner with the board showing , Duc held full house that fell to Kjell’s quads. 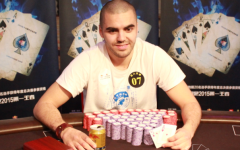 Kjell shipped the VND 108,640,000 (US$4,670) pot. 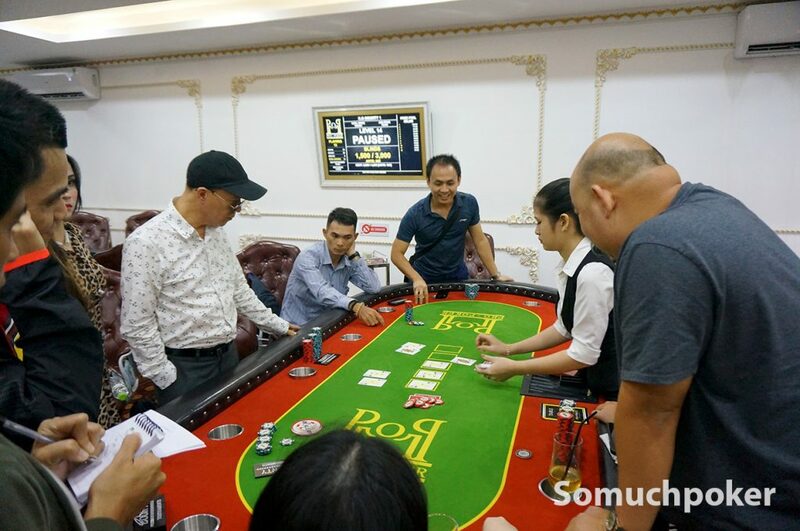 The No Limit Hold’em event drew 80 entries for a prize pool of VND 543,200,000 (US$23,300). Taking a look around the room, the event attracted many familiar faces that by the time the final 8 was reached, half were known figures namely Feng Zhao, Hai Chuot, Julien Tran and Nguyen Quoc Vu. After a grueling eleven hours, heads up was finally reached with Tran and Quoc Vu facing off. While this was Tran’s first appearance at a final table in this series, for Quoc Vu, he was back in familiar ground. Just yesterday, Quoc Vu made the final table of the DSO event and finished 3rd. 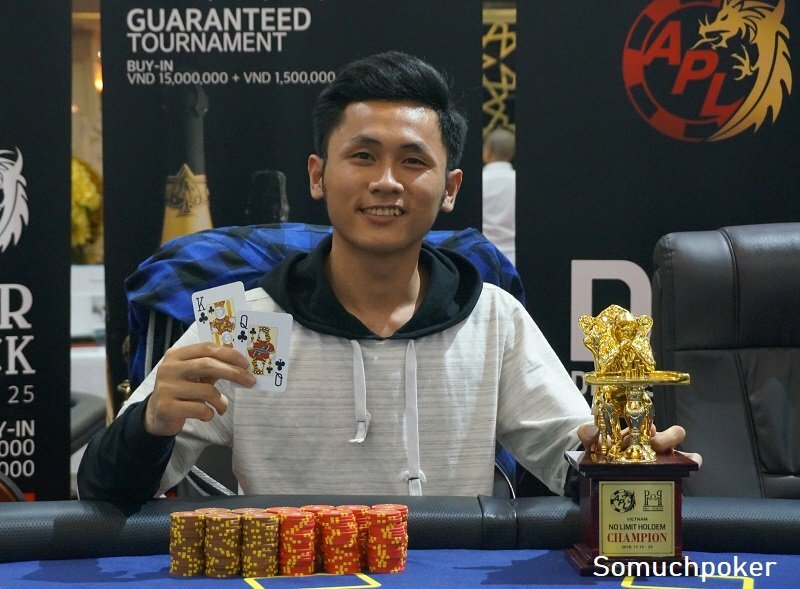 The heads up round began with a fiery Quoc Vu quickly taking over the chip lead. He continued to increase his lead until that first big hand between them knocked him back down. On a completed board of with bets on every street, Tran check-raised all in and Quoc Vu called. Tran doubled up with full house over Quoc Vu’s . The next hand, Quoc Vu claimed his own double up with a lucky straight on the river with over on a board . Still behind, Vu landed another double up with connecting with a pair to overtake Tran’s . Tran managed to squeeze in another double with A-K holding against K-7, but it wasn’t enough. Tran shoved with , Quoc Vu snap-called with , the board ran to end the tournament with a glorious victory for Quoc Vu. Vu claims the first trophy for the host country. 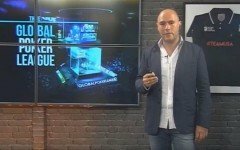 You can watch the final table of this event in the Pro Poker Club YouTube channel. At the No Limit Hold’em Turbo event, 38 players took seats with 11 re-entering. Impressively, Japanese player Azusa Maeda was seen at the final table once again. Maeda finished 4th at the earlier KO Bounty event and fell 4th at this event as well. Knocking him out was Shyh Chyn Lim who proceeded to send the rest of the players to the rail. 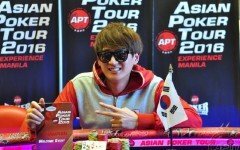 Lim claimed the VND105,520,000 (US$4,500) first prize and the trophy, which he said would be the first of many to come. With those events completed, up next is the APL Ho Chi Minh City featured event – the Main Event VND 8 billion Guaranteed. Action gets underway on Sunday, November 19 at 1pm. The event will run a total of 7 days with four starting days. 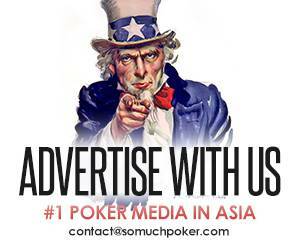 Buy-in is VND 16.5M.